Target Audience: Kids, mostly. But definitely some crossover appeal to adults. Of all the pirate musical artists it’s the childrens’ entertainers for which I have the lowest expectations. I can’t tell you how many pirate kids’ albums I’ve never even bothered to seek out based on their sample tracks that clearly demonstrate a soft, froofy performance that would be of no interest whatsoever to those over the age of six. Mike Mennard, however, is a different beast entirely. True, children are clearly his target audience. But he also demonstrates remarkable creativity and talent the likes of which can be thoroughly enjoyed by all ages – mostly. 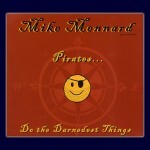 This album opens with its title track “Pirates Do the Darndest Things” – a catchy, brilliant tune that encompasses the CD’s key strengths and weaknesses bundled together. The song itself is original, unique, well-crafted and witty. It’s a song that anyone who loves modern pirate music will instantly cherish – except for the pirate jokes and ad-lib comments tucked between verses – jokes that kids will surely fine hilarious, but which will mercilessly grate at the nerves of adults like shark-skin across a sunburned backside. This trend of almost-adult-friendly musical genius is continued throughout the album. Approximately 18 tracks of music interspersed with 10 or so shorter narrative sketches and jokes. These short narratives are exceedingly well done, with sound effects and complimentary music, but likely will be much more enjoyable to kids than adults. As to the songs – they vary in age appropriateness, but remain of a consistently high quality. 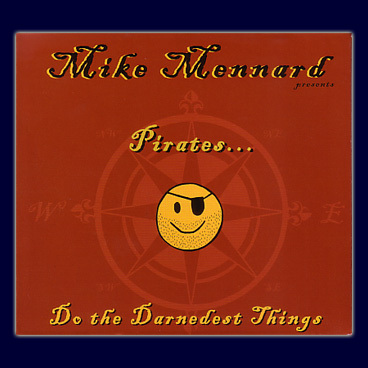 A Pirate’s Life For Me is Mennard’s version of the Disney favorite, this time performed in a bit more of a barn dance twang than is usually heard (pass the pirate moonshine, y’all!) Arrh! is a fun bit about what it takes to be a pirate, while Swab the Deck features a string of orders a pirate might shout at his attending cabin boy. Fifteen Men is an adaptation of the Robert Lewis favorite with new lyrics and a marching cadence quality. Bucanneer on Broadway then takes a truly unique tack as it features a pirate singing about how he’d rather perform on stage. The delivery is hilarious, and does indeed sound like it belongs on Broadway. Early in the Morning / Blow the Man Down also stands out in that it’s something of a musical duel between a crusty, shanty-singing pirate and a pirate-themed soft rocker. Long time pirate fans will surely get an insider’s kick as the pirate complains that, “that doesn’t sound like pirate music,” and then get an additional, if unintentional chuckle from, “I’d do more than *that* to a drunken sailor” which takes on an amusing double meaning for those of us with unclean minds. While most every song of this CD features elements that remind this is a childrens’ album – references to rootbeer or silly jokes and puns – by and large it remains enjoyable for all ages. There are, however, some tracks that grown-up pirates just might not be able to stomach. Most of the mini-tracks are quite kid-centric, as are songs such as Capt. Mother Goose, Captain Jack Whiney, and Pirates of Nice. I’d love to criticize Mike Mennard for failing to create a truly adult-friendly album, as I’m certain his clear talent for the subject would be an asset to the genre. But then I remind myself that if today’s children are to become the pirates of tomorrow, then they need music that will get them off to a good start. And in this way Mennard is sewing the pirate seeds for tomorrow’s swashbuckling scalliwaggs. That he does so with such musical skill and wit as to make the album “mostly” adult friendly is a happy bonus. Just try not to cringe too much at the silly jokes, and remember it’s for the greater good. This entry was posted in Music and tagged children, humor, mike mennard by Bilgemunky. Bookmark the permalink.